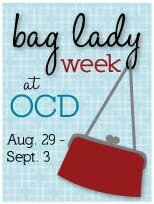 ocd: obsessive crafting disorder: Bag Lady Week: Quilted Hexie pouch tutorial and a giveaway by the Plaid Scottie! Bag Lady Week: Quilted Hexie pouch tutorial and a giveaway by the Plaid Scottie! Kaelin from The Plaid Scottie is here! Howdy ho neighbors! I'm Kaelin from The Plaid Scottie and I'm collaborating with my favorite Canadian Kristie to bring you a Quilted Hexie Pouch for her fabulous Bag Lady Week! The finished pouch measures about 7.5" x 7.5"
Note: You might notice throughout the photos that I have interfacing on the back of my exterior fabric. You won't need interfacing if you use regular quilting cotton, because the pouch is sturdy enough without it. I only used interfacing because I was working with linen and it keeps the fabric from stretching and distorting. Alright. Let's get this party started. Grab you hexie panel. It should be sewn together just like the picture below. Once you have your hexie panel sewn together, you'll need to square it off by trimming the ends. The top and bottom are fairly easy - just lop off the pointy ends. But on the sides, you'll need to fold out the seam allowances on the hexies in the short rows (the two rows with only 4 hexies). Once the seam allowances have been pressed out, line up your ruler with the edge of the seam allowance and trim off the excess. Grab your two 1.25" x 5.75" pieces and sew them onto the top and bottom of your hexie panel. Press your seams to set in place. Attach the two 1.75" x 6.75" pieces to the sides and press to set. Grab your three flannel pieces and coat with a spray adhesive like 505. You can pin, but with something this small, it's much much easier to spray baste. I keep a cardboard box lid in my sewing room just for spraying small projects like this. Grab your 6.75" x 8.25" flannel piece (leave the other two where they are) and place your hexie panel on top of it. Press to adhere. Quilt the flannel and hexie panel. I used free motion, but you can quilt it however you like - straight line, etc. Here's a view of the back so you can get a better look at the quilting. Grab your other two pieces of flannel and match them up with their corresponding exterior pieces. Quilt. Now find your 6.75" x 8.25" lining piece. Layer as follows: Lining (right side up), zipper (right side up and centered), hexie panel (wrong side up). The zipper should be running across the top, 8.25" side. Make sure the zipper pull is hanging off the end, and pin the layers in place. Fold the lining back and press both sides in place. You might have to tug the fabric down a little before ironing. Top stitch (about 1/8") from the edge. Grab your remaining exterior and lining pieces and repeat the same process (layer lining (right side up), zipper, and exterior (wrong side up) - just like you did on the other side of the zipper). Pin in place and sew 1/4" seam. Unfold, press and top stitch. Move the zipper pull over a little, and sew the two sides of the zipper together to keep them from pulling apart too far. If you look below at the right end of the zipper (the part that's hanging off), you can see my stitches where I sewed across the zipper. When you're done, go ahead and open the zipper 2/3 of the way. Now grab your 2" x 14" interfaced piece. Fold in half and press. Unfold, and tuck the edges in toward the center seam you just made. Fold in half along the original center seam you made and top stitch down the open end. It should be about 1/2" wide and look like the photo below. Fold the strap in half and place the raw ends about 1" below the zipper. Fold the lining back so it doesn't get caught in the seam, and attach the strap to the exterior with an 1/8" seam. Doesn't have to be fancy - it's just to hold the strap in place until we sew the pouch together. Next you'll layer as follows: remaining 8.25" x 8.25" lining piece (right side up), exterior hexie panel (right side up), remaining exterior panel (wrong side up). Pin and sew all three pieces together along the top side only using 1/4" seam. Now fold your exterior panels back so that they're right sides together. Sew a 1/4" seam along the bottom only. Repeat for the lining panels, leaving about a 3" opening in the center. Now fold all the layers back together so that they make a wholesome and delicious fabric sandwich. Sew ALL four layers together along the sides, starting 1/4" from the top and ending 1/4" from the bottom. I brought out big momma walking foot for this job because of how thick the layers are together, and I recommend you do the same. When you get to the zipper, sew over it, and then back up and run over it again to make sure it's good and dead secured. You'll actually end up going over it three times once you go forward, hit reverse, and then go forward again. Do this for each side of the pouch. Your pouch should now look like the photo below. Trim the corners and excess zipper, then turn the bag right-side out through the opening in the bottom of the lining. Then sew the opening shut with a teeny tiny seam. Finish turning your bag right-side out and you're done - YAY! Great tutorial! I love the tip about spray basting little things in cardboard box. I love any tutorial for bags or totes! Thanks! The hexies add so much brightness to this pouch. Love it, and am going to try it. Think I can handle 23 hexies. Other tutes? I'm a Christmas kind of girl, so would love to see something festive. Maybe a fun quilted tree skirt? So cute! I love this little hexie pouch. I'm always looking for good purse/pouch patterns! Great little purse - And I think even I can manage these few hexies!! I'd love to see a pattern for a clutch with good structure and using a metal frame! Great tutorial. I just made a small bag like this and struggled with the directions. Wish I had seen your tutorial first. I like the idea of spraying in the little box. I would like to see a tutorial on making coin purses or regular purses with the metal handles. So cute! Thanks very much! I love tutorials for tablerunners and gift ideas! Thanks for showing that zipper, I have a devil of a time, don't do them enough. Great tutorial! Thanks! I'd love to see one for backpacks. Ooh! Love the hexies! So cheerful and great colours! I'd love to see a patten for a little tri-fold wallet. Maybe even one with a little zipper for coins. Thanks for the great tutorial! I`d love a fold wallet with zipper for coins. I love the wristlet pattern! Great tutorial! Thank you so much to Kaelin for taking the time to share that with us! Utterly utterly gorgeous! This could be done is so many different colours and variations. I love the hexie pouch! Adorable! I love bags and have been looking for the perfect new one to make - so a bag pattern for something not to large with lots of inside pockets would be great. And I think I will be making this little hexie pouch. It is so cute. What a cute litle pouch! I love the hexies...might just have to give in and join the craze. Thanks for the tute Kaelin. I've really enjoyed checking out all the tutorials. This bag is so cute! Perfect for the quick dashes to the store or carrying a few bucks for garage sales! I am in the process of making this write now, thanks for the awesome tutorial! I love pouch patterns, so more of those, please!! Quilt along announcement and a Go! Baby giveaway!